Paperback Priced to Give Away for Free! One of the most common behavioral problems in cats is inappropriate elimination. It interferes with healthy relationships within the home, and results in many surrenders and returns to shelters. We’ve found a way to offer this booklet at extremely low prices to allow shelters, rescue groups and veterinary clinics to buy it in bulk and give it away for free. Retrain older cats to use the box instead of the carpet! Trust that your cat will find the right bathroom so you can relax! Patricia McConnell wrote this booklet to both prevent and treat litter box problems, by helping you to design a litter box system your cat would request if she could talk. It includes specifics on box size (they are often too small), what research tells us about litter preferences, the importance of litter box placement, and how to treat established problems. The Fastidious Feline can’t always work miracles, but it has made a lot of cats and cat lovers very happy. Strongly recommended for any owner looking to get a new kitten, adult cat, or anyone having trouble getting their current feline friend to use the litter box. Following this clear and concise eBook to the letter will help to ensure a clean home, and happy human. Help your clients address the fundamental training task of liter box training by recommending with this simple, easy-to-follow booklet. This booklet has saved thousands of cats from being sent to shelters for a problem that if often treatable by their owners. Use this resources to help cats stay in their homes, and owners sleep easy knowing there will be no messes to clean up in the morning. It’s a win-win! We all know that litter box problems send innumerable cats to shelters because their owners don’t know how to treat them. The Fastidious Feline has helped thousands of cats stay in their homes, and allowed thousands more to enjoy a new life in what becomes their forever homes--that are forever clean! It should be required reading for any cat owner." everyone of our clients whose cats have litter box problems." 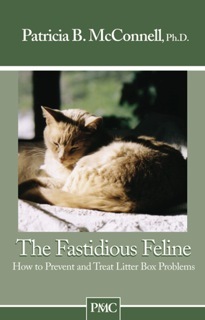 "I ordered The Fastidious Feline book because we have a very good kitty who has changed her litter habits just recently. I received the book a day ago and sat down last night to read it. I have to say that Patricia is an extremely good writer! I find the book not only the most informational book about litter problems, but very enjoyable to read. Her style of writing is easy to read and a bit humorous which it encourages me to continue reading. I have only a couple more pages to go in the book and it has given me a good direction to go in for helping our kitty with her issue. … I truly appreciate her book and all of the research and information she put into it. It has been extremely helpful so far and I hope to find the answer to our kitty's litter problem."